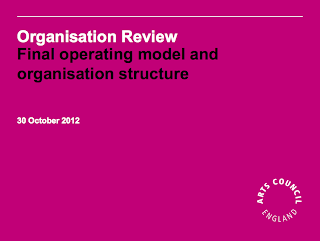 The result of the spending review at the Arts Council has been announced. 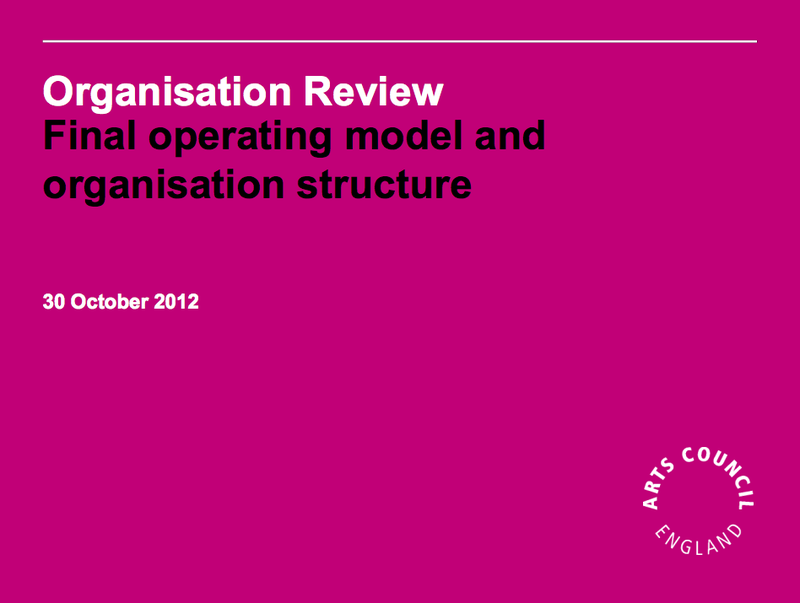 The Government required the Arts Council England (ACE) to reduce its administrative costs by some 50% as part of the 2010 Spending Review. It was a foregone conclusion that this could not be a death by a thousand cuts exercises. Radical changes had to be made to the way the Arts Council worked. 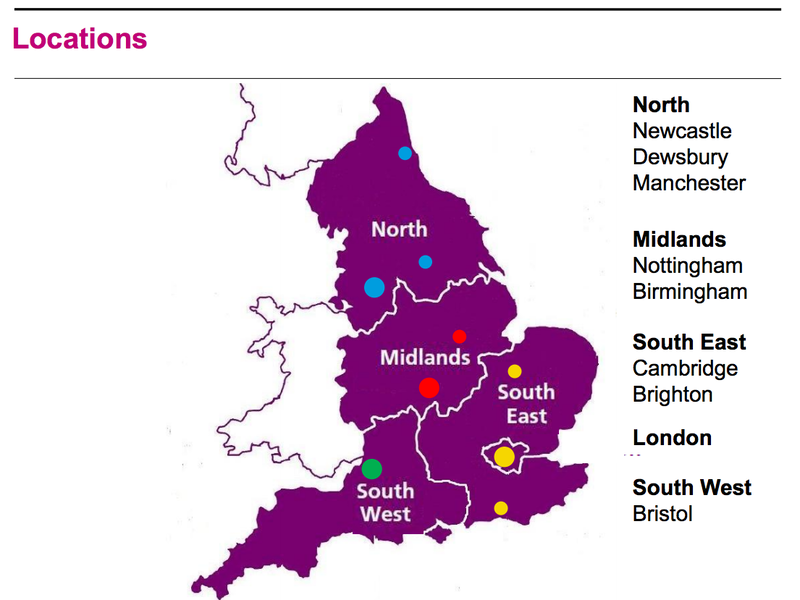 offices to close and regions to be cut from 9 to 5 and merge. Click the pink map pins to find out more about the visual arts organisations who are receiving funding. At the end of the day this is an organisation which is going to be judged by the quality of organisation which it supports on the ground. How is it for you in your area? Posted by Making A Mark on Wednesday, October 31, 2012 0 comments Who's linking to this post? This is a pictorial review of some of the 375 artworks in The Natural Eye - the 49th Annual Exhibition of the Society of Wildlife Artists. Names of the prizewinners and a video of the exhibition will be posted later this week. At the end you can also find links to my reviews of past exhibitions of the Society of Wildlife Artists. First some photographs of some of the exhibition paintings, drawings, fine art prints and sculpture selected for the exhibition. Interestingly there are absolutely no snow leopards and only one tiger which is a graphite drawing of the tiger in its habitat. I must confess I really enjoy an exhibition which gives so much space to such a wide range of species. Posted by Making A Mark on Tuesday, October 30, 2012 1 comments Who's linking to this post? 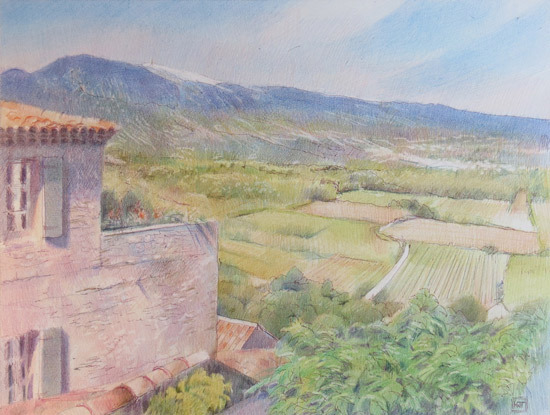 This post is for ALL watercolour painters - wherever you live - who are interested in submitting their watercolour paintings to the Annual Open Competition of the Royal Watercolour Society. The RWS Contemporary Watercolour Competition 2013 has issued its Call for Entries and the details are summarised below. This post summarises the details of who can enter what and how which can be found in the 8 page application pack! The definition of the aim of the competition has changed since last year. This year there is more emphasis on practising artists and international entries. 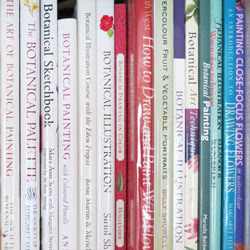 Prizes will include Art materials, Purchase prizes, Cash awards from the RWS from £500 to £1000 and the opportunity to exhibit in the Royal Watercolour Society’s Spring and Autumn Exhibitions during 2013. The RWS's guide proceeds straight to "how to enter' without starting with "who can enter". I prefer to start with "who" as it avoids wasting people's time! However the covering letter indicates that this is a truly OPEN art competition. Any artist (providing they are not a member of the RWS) working with water-based media can apply. We welcome international applications, but applicants must be aware that if their work is chosen for exhibition they will need to arrange a courier, as works will not be accepted by post. That means all the Americans and Europeans and Russians and Chinese and Japanese and whoever else can ALL APPLY to this competition. I know I've seen entries by international artists in the exhibition for the open competition in the past and I believe the RWS is keen to expand the number of entries coming from artists from other countries. There's certainly quite a few RWS members who are currently taking their art to other countries! Posted by Making A Mark on Monday, October 29, 2012 2 comments Who's linking to this post? I've been a huge fan of Kaffe Fassett for ages - I think his talent with colour and mixing patterns is absolutely phenomenal. Back in the days before tenosynovitis set in, when I could still grip and hold knitting needles, I loved to knit his designs. If you are in any way interested in colour and/or textiles and/or patchwork/quilts then you should definitely take a peek at his website. 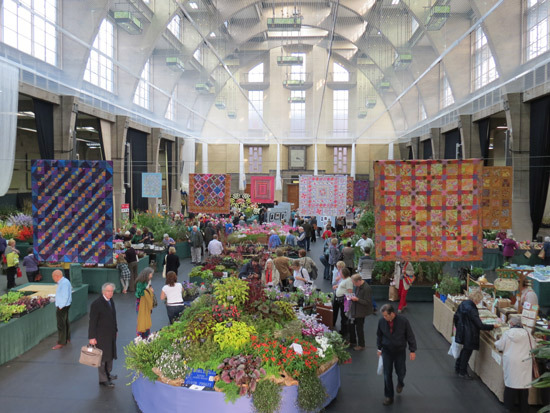 Anyway - his quilts were my main reason for going to the RHS London Autumn Shades show at the RHS Halls in Westminster last week - as there were to be a number of Kaffe Fassett quilts on display. I walked in and was absolutely amazed to find they'd hung the quilts in mid-air so both sides could be seen and you could get a close look without there being any danger of them being damaged in any way. 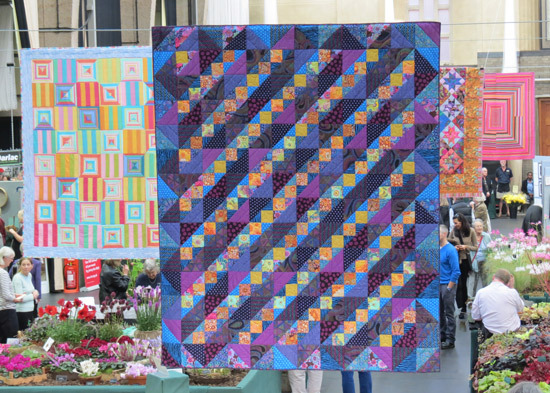 So quilts by Kaffe Fassett will punctuate this post as I think they're wonderful! 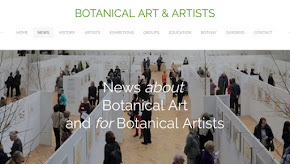 Going to the exhibition also meant that I got to meet two more RHS Gold Medal winners - this time for botanical photography - see RHS Gold Medal winning Botanical Photography for the images of the photographs. 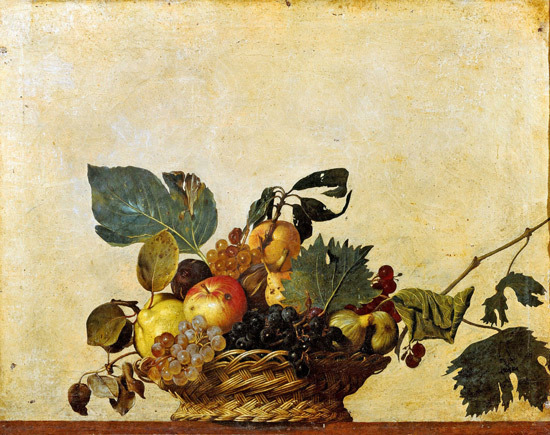 Coming out of that is a post next week about Juan Sánchez Cotán (1560 - 1627) the artist whose style influenced Clay Perry's work when photographing heritage fruit and vegetables. I was intrigued to find when I got home that Clay Perry used to photograph the avant garde art scene in the 1960s - including Robert Rauschenberg and Yoko Ono - this is a link to Clay's photos of Yoko Ono and her Half-a-Room installation in 1967. I also discovered that he also photographed R&B bands in the 1960s who subsequently became rather famous! Cue moody photos of Eric. So I dug a bit further and found out that he had been a pupil of Ifor Thomas who was a pioneer teacher of photography as fine art (from this interview). That to me came over very clearly in the photographs in display at the exhibition. I always say that I have no difficulty identifying Gold Medal work as it always stands out. Posted by Making A Mark on Sunday, October 28, 2012 1 comments Who's linking to this post? Last week I went to the RHS London Shades of Autumn Show at the RHS Horticultural Halls, Westminster. This show had an Exhibition of Botanical Photography. This photography is very much leaning towards the aesthetic and artistic end of botanical photography as well as recording plants, flowers, fruit and vegetables and gardens. Below are photographs of the two Gold Medal Winners - Clay Perry (Norfolk) and Nigel Chapman (Hampshire). The first is professional photographer Clay Perry who apparently entered at the last minute after being told about the exhibition. This was Clay's first RHS Show. However he has previously shown his portfolio of Heritage Fruits and Vegetables at RHS Wisley in connection with the publication of his book Heritage Fruits & Vegetables published by Thames and Hudson - with text written by Toby Musgrave. He wanted to draw attention to the loss of traditional vegetable varieties and managed to get RHS Publications interested in the idea. He then began the long process of sourcing and photographing all the different fruits and vegetables for the book. He was helped enormously by the The Lost Gardens of Heligan which focuses on the traditional varieties. They shipped the fruit and vegetables to his studio and then he set about finding the best way to photograph them. Posted by Making A Mark on Saturday, October 27, 2012 1 comments Who's linking to this post? the first in a series of occasional posts which bring paintings I like and/or some paintings by an unexpected artist to the front page of this blog. The last bit is key! Before I go on - participants in this guessing game are asked to refrain in the first 24 hours from using any available technology to search on the image. Let's go back to using that old fashioned resource for recognising paintings - namely our "brains"! I have changed the title of the file for anybody who was thinking of checking that out! So - here's the first painting. Feel free to hazard a guess while you're trying to work it out. I guarantee you've all heard of this artist and it's nobody obscure! You have until 6pm GMT on Saturday to guess it. If nobody has got it by then you can 'have at it' and bring in the big digital brain to bear on the subject! I'll update this post when somebody has got it. Posted by Making A Mark on Friday, October 26, 2012 17 comments Who's linking to this post? This is a summary for the Call for Entries for the second Wildlife Artist of the Year run by the BBC. Last year, this competition receieved well over 1,000 entries from all over the world - including entries from countries as diverse as Malaysia, Tasmania, Israel, Nepal and Canada. 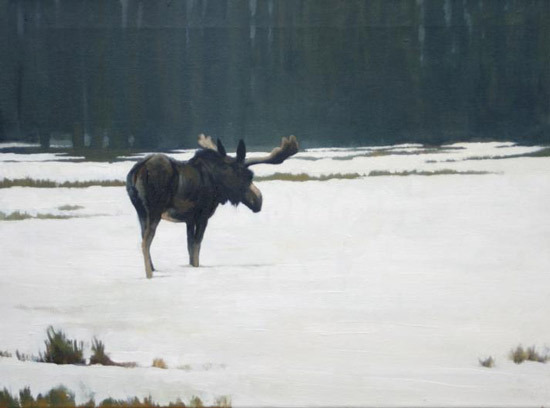 The Winner in 2012 was Heather Irvine for her picture The Last Winter which portrayed an old moose. The deadline is the end of February. The initial screening of entries takes place in March. A shortlist of the best images in each category is compiled. Artists on the shortlist are then invited to submit framed artwork and the final round of judging of this artwork takes place in May. Those artists who have been successful get to find out the result by the end of April. 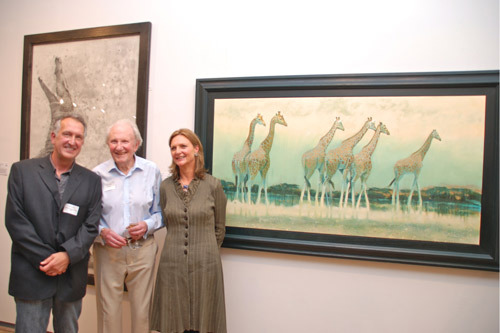 Only the artwork which wins a category gets to be in an exhibition - but this exhibition is the prestigious annual exhibition of the Marwell International Wildlife Art Society which runs from Friday 30 Aug 2013 to Sunday 1 Sept 2013. In addition, the BBC Wildlife Artist of the Year has his or her winning picture displayed at the Society of Wildlife Artists’ annual exhibition at the Mall Galleries, London, in autumn 2013. Unless you're reading the BBC's Wildlife Magazine you may be a bit confused if you consult the website as not all the details and dates have been fully updated yet to reflect the 2013 competition. Posted by Making A Mark on Thursday, October 25, 2012 2 comments Who's linking to this post? There are TWO Wildlife Artist of the Year art competitions in the UK - the one run by the BBC and the one run by The David Shepherd Wildlife Foundation (DSWF). Both have now issued their Calls for Entries for their 2013 competitions. At the end of tomorrow's post I'll also be providing a summary of the similarities and the differences between the two competitions. 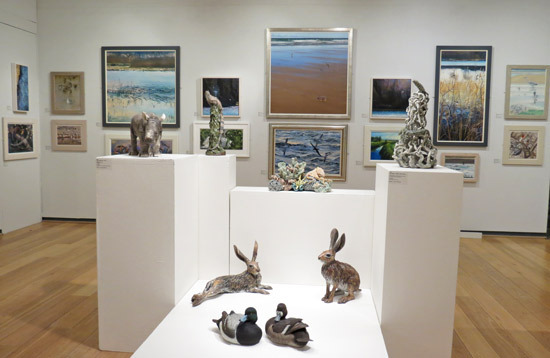 Last year the exhibition at the Mall Galleries raised over £60,000 for endangered wildlife and as always was both popular and enjoyed critical success. This is a competition which is sits well on the CV of any wildlife artist whose work gets selected for exhibition! It's good to see this competition providing a very precise description for original art. Those who copy photos taken by other people without any original input from the artist need not apply! This year the prize-giving and exhibition will be held in London between 2nd-8th June 2013. Overall Runner-Up £1,000 cash prize. Remaining Category Winners £500 each. Posted by Making A Mark on Wednesday, October 24, 2012 0 comments Who's linking to this post? So who else is also painting pumpkins? Posted by Making A Mark on Tuesday, October 23, 2012 3 comments Who's linking to this post? This is a technical post about what you need to include on an invoice when exporting an artwork to another country. First, to be honest, I'm writing it all down because I forget! I've sent quite a few artworks overseas but I always have to spend time double-checking I've done everything correctly after referencing all the proper sources of information. a link to where you can download a proforma invoice like the one I use (see below). 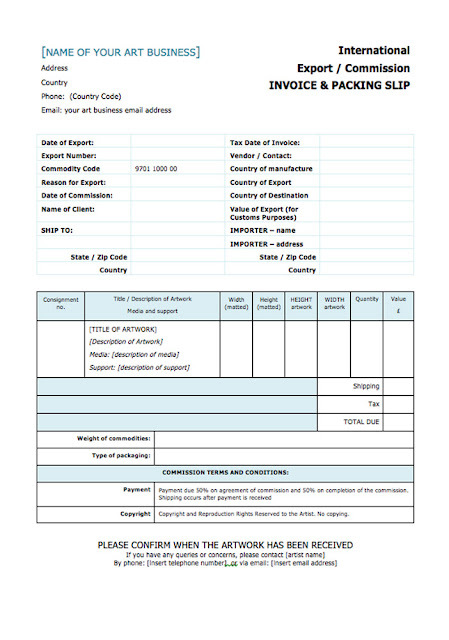 The example proforma invoice referenced is for an artwork which had been commissioned and is to be exported to another country. You can find An Export Invoice for Art available as a Word document on my Making A Mark website - which you can download for FREE. Posted by Making A Mark on Monday, October 22, 2012 3 comments Who's linking to this post? If you ever want to commission a drawing or sketch see the side column for how to contact me. Posted by Making A Mark on Sunday, October 21, 2012 1 comments Who's linking to this post? Categories art, art competition, art economy, Art Galleries and Museums, coloured pencils, copyright, exhibition, exhibition review, opinion poll, painting, printmaking, who's made a mark this week? Posted by Making A Mark on Saturday, October 20, 2012 3 comments Who's linking to this post? Elizabeth Meek has won the brand new Royal Award - The Prince of Wales Award for Outstanding Miniature Painting - at the 2012 Annual Exhibition of the Royal Society of Miniature Painters Sculptors and Gravers. The exhibition is in the North Gallery of the Mall Galleries and continues until 28th October daily 10am to 5pm; (closing - at 1pm Sunday 28th October). The Exhibition also contains a special exhibition of "The War Years". 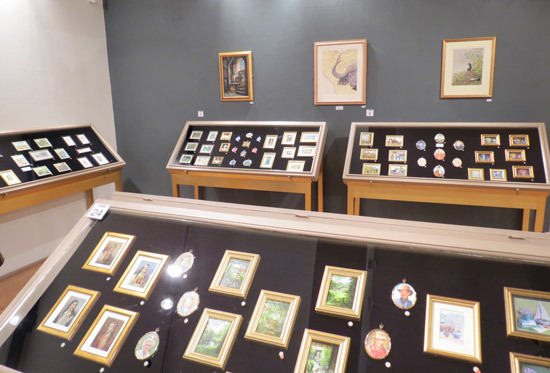 This mini exhibition covers the four decades of between the First and Second World Wars and the miniatures painted during those times. They chart the changes in the way people looked and the topical events of the day. I found the exhibition to be its usual high standard with many different UK and international artists submitting entries. Posted by Making A Mark on Thursday, October 18, 2012 0 comments Who's linking to this post? For some curious reason, The Making A Mark Poll for September which asked "What's the Best Method of Promotimg Art Sales" got a very low response rate. the best way to PROMOTE art. They're actually two different topics - within a model of marketing (The 5Ps of the Marketing Mix - see below) which suggests that there are a number of different considerations which need to be taken account of when marketing anything. Below I provide the results of the poll and then go on to highlight the distinctions between where you sell your art and how you promote that sale. Bottom line - artwork does not sell simply because it gets hung on the wall of a gallery or posted to your blog or an auction site. First you have to get people to look at it and to find it attractive. Only 22 responded to the September Making A Mark Poll. The results are suggestive of good practices. Both Twitter and Facebook were in the bottom half of the responses - as was advertising. It was difficult to detect any difference between artists who sold via galleries and those who sold direct to their customers and clients. Posted by Making A Mark on Wednesday, October 17, 2012 6 comments Who's linking to this post? The reason for highlighting it on my blog is that submission is electronic - which opens up the competition to international entries. 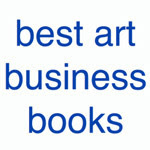 All winning images will be published in the spring issue of O’Keeffe Magazine and on the Georgia O’Keeffe Museum web site (beginning February 1, 2013 – March 1, 2013) plus there are various awards to be won (see website for details). The First Prize is $500 + Santa Fe Photographic Workshop Intensive, Annie Leibovitz signed edition of Annie Leibovitz: Pilgrimage; signed edition of Roxana Robinson’s biography, Georgia O’Keeffe; and a select item from the O’Keeffe Museum gift shop. Anybody care to guess what my flower is? Georgia O’Keeffe was famous for her interpretation of flowers. Some realistic, some abstract...but always beautiful. 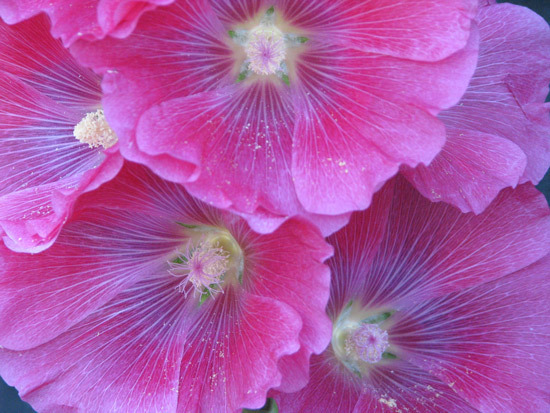 In her spirit, please share with us photographs of your favorite flowers — those pictures that capture your heart and capture the beauty and magnificence that is nature. 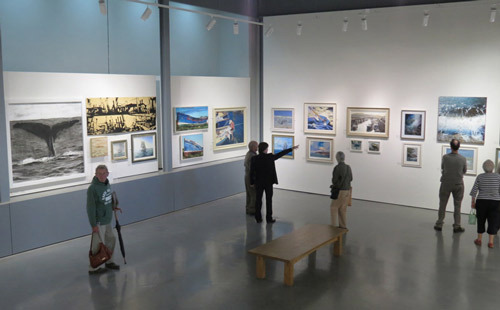 The Georgia O’Keeffe Museum invites anyone enthusiastic about photography and art to enter the Georgia O’Keeffe Museum Photography Contest. Posted by Making A Mark on Tuesday, October 16, 2012 3 comments Who's linking to this post? 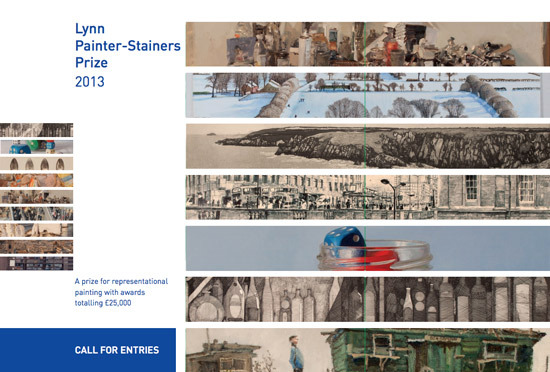 The Call for Entries for the 8th Lynn Painter-Stainers Prize has been published. The Prize encourages the very best creative representational painting and promotes the skill of draughtsmanship. 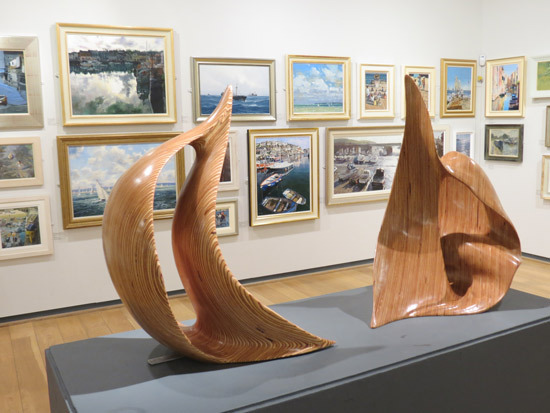 The Exhibition of works selected by the Panel of Judges will be held at the Mall Galleries in February 2013. I have to say I do very much like the brand new website which the Prize has this year. To download the Call for Entries leaflet, Entry Form and labels, please visit the Info for Artists page. The Judges will select approximately 100 works for the Annual Exhibition which will be held at the Mall Galleries, The Mall, London SW1 from 18th February to 2nd March 2013. Admission is free. What's happened in the past? Nina Murdoch - painter in egg tempera. Nina has exhibited across the UK and won numerous awards including 1st Prize in the first Threadneedle Art Prize 2008. Antony Williams RP, PS, NEAC - painter in egg tempera. Antony won 1st Prize 2012 Lynn Painter-Stainers Prize with his painting Still life with electric fan. Andrew Lambirth - writer. He's a regular contributor to The Spectator and has written books and essays on numerous contemporary artists. First things first - it helps to be realistic about the chances of success. In 2012, 1,150 entries from all over the UK were submitted and 98 were selected and hung in the exhibition. That equates to 8.5% chance of a work being selected - which as major competitions go in the UK is actually pretty good! The other way of looking at this is that you have a 91.5% chance of spending money on framing, transporting and submitting your artwork for absolutely no return. 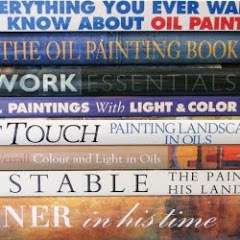 So if budgets are tight you need to make sure you are fully aware of what costs are involved and have confirmation in writing (see my Recommendation at the end re unselected and unsold works). Posted by Making A Mark on Monday, October 15, 2012 0 comments Who's linking to this post? This week I'm starting with a watercolour competition which hasn't been mentioned on this blog before. Artists from 62 countries this year entered watercolour paintings for the The Shanghai Zhujiajiao International Watercolour Biennial Exhibition - the only international watercolour competition held in China. The aim of the competition is to develop the art of watercolour painting in China by bringing them into contact with the finest watercolour artists from around the world - and their paintings! The artists who painted the 15 paintings with the most votes are awarded a cash prize of CNY30,000 (around US$4,700) plus a return economy class airfare to Shanghai to attend the opening accommodation and meals to enable them to attend the opening of the exhibition in November. 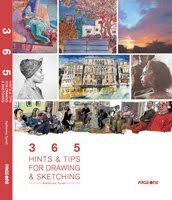 The winner of the competition gets a full set of 232 Daniel Smith Extra Fine Watercolors Collection worth nearly $4k. David Poxon RI NWS this week sent me a list of award winners - and he's one of them. All except Charles Reid will be attending the opening celebration in November. Joseph Zbukvic Australia - take a look at his studio! If you look at the notes below his paintings you'll see he's providing tips on how to produce work like this. 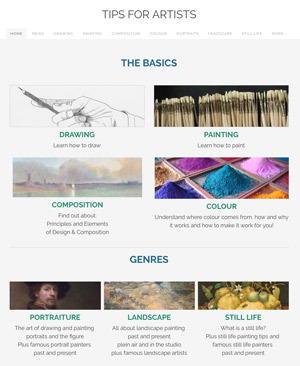 The links in the names above are to the websites of these master watercolourists - definitely worth taking a look at! Chinese watercolours focus more on the theme and meaning behind the subject. There is more personality in overseas watercolour paintings. Chinese watercolourists are more focused on showcasing techniques and expressing the deeper meaning behind the subject. Most Chinese artists have a job in an art-related field and do not rely in sales to make a living. Cathy Holtom (Down a dusty lane......) has written about 15 shades of black of pastels, pencils and ink. Ester Roi (Ester Roi Fine Art) has started to produce oversized giclee prints from works in coloured pencil - see Introducing Oversized Limited Edition Giclees. Ester for me is one of a few coloured pencil artists (and inventors) who have a proper appreciation of how to bring coloured pencil art (and inventions!) to the market in a way which gets it taken seriously. It's one thing to produce it, it's quite another to get it sold! Posted by Making A Mark on Sunday, October 14, 2012 2 comments Who's linking to this post? Categories art, art competition, artists, exhibition, exhibition review, painters, painting, watercolour, who's made a mark this week? 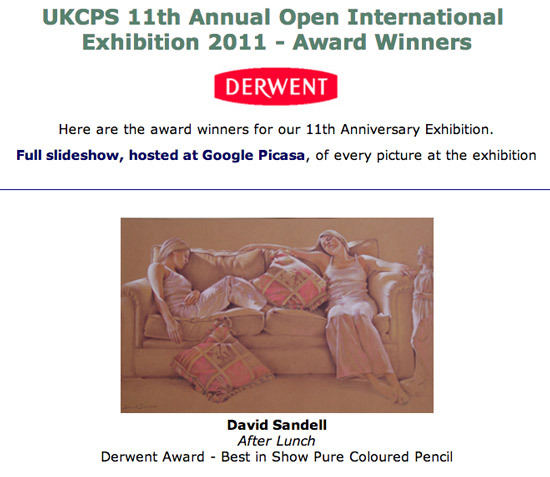 David Sandall has won the top award for pure coloured pencil artwork at the UK Coloured Pencil Society's 11th Open International Exhibition 2012. This opened last Saturday at the Nuneaton Museum & Art Gallery. The exhibition continues until 25th November 2012. You can find the Award Winners on the UKCPS website. I've also got them listed below along with links to their websites and artwork. What's noticeable this year is that many of the top award winners have not won a prize with the Society before. Indeed I don't know a number of the names which suggests they've not exhibited with UKCPS before. 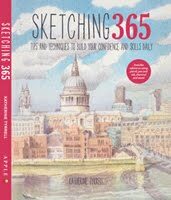 I found it interesting - and very exciting - that the top prize went to a coloured pencil drawing of people. All David Sandall's work on coloured paper are self-evidently drawings. He chooses to refrain from filling all the background. His work in no way attempts to masquerade as a painting. I note that the Awards have also moved on again and that there is now an award for still life which memorialises Peter Woof who died on September 27 2011, aged 55, just before the last annual exhibition. Still life was an aspect of coloured pencil art which Peter made his own! Here's the artwork I liked - based on the Picasa slideshow which gives you an excellent view of all the artwork in the show. I've included links to artists who have not been mentioned above. Suzy Herbert ~ Freedom 22x20cm I'm always intrigued to see what visual joke Suzy will come up with this year. Humour most emphatically has a place in art. 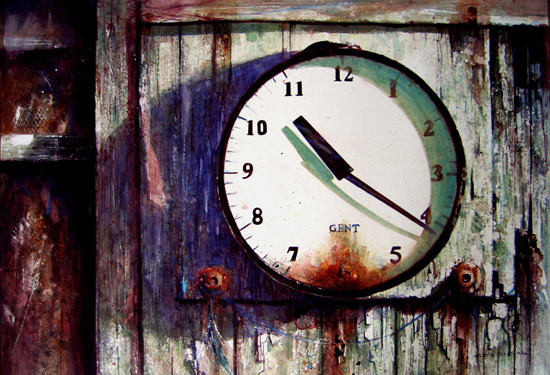 Denise Howard ~ Better Days Behind 40x30cm I thought this piece was stunning. Karen Musgrave Hill ~ Dancing Chillies 34x25cm I really like the simplicity of different views of the same simple subject on a completely plain background. This artist has really looked at that chilli. Kris Owen ~ Best Mates 37x29cmIt took a while a little while to work this one out. I like artists who don't spell it all out to those viewing - a conundrum draws you in and gets you involved with the work. I also like the fact the foreground and background complemented rather than competed with the real subject of this drawing. Plus there's character in there even though they both have their eyes closed! Janie Pirie ~ Lilac Blossom 50x45cm Janie does stunning botanical works - simple as! That lilac colour is the most difficult colour to get right. Janie has captured all the nuances which exist in real life. Pamela Preller ~ For Once There Was 37x46cm Different! David Pritchard ~ all his animals are excellent! I don't ever recall seeing his work before and wonder where he's been hiding! Ranjini Venkatachari ~ Epiphany 45x61cm (mixed media) - I liked the visual pun in this one. It's certainly not a subject I've seen before. I've not been to Nuneaton so these observations are done from the perspective of the online exhibition of all the work selected for the Exhibition. I have to say I found the works selected for the exhibition both pleased and disappointed me. It's good to see some new and more professional artists getting involved with the society. It's good to see some new styles and some excellent quality. At the same time it's disappointing to observe that the Society still has some way to go before there's a greater congruence between the artwork selected for this exhibition and the type of artwork I see at the exhibitions of other national art societies. For example, as always there is a huge emphasis in the UKCPS exhibition on highly realistic artwork and very little painterly or impressionistic work. Elsewhere I see a much greater range of styles - even by those relying on photos for references. Maybe some coloured pencils artists don't submit such work on the basis of what they see in the exhibition online? 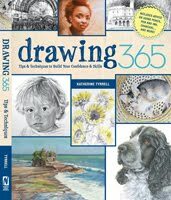 It's good to see some evidence this year of the beginnings of new styles and approaches to making art with coloured pencils. However I see very little change in the subject matter. At no other national society do I see more than 30% of the artwork in the exhibition portraying animals. (Can I emphasise at this juncture that I like good wildlife art - however I also enjoy landscapes, botanical and still life). Elsewhere it's typical to very usual to see landscapes accounting for a significant proportion of an exhibition - however at UKCPS for some reason this year landscapes make up less than 10% of the works selected. Also while the standard at the top end is going up I personally feel that some of the work selected falls far short of the quality I've seen in previous exhibitions. A lot of people won't agree with what I've said. Others may observe that it needed saying. 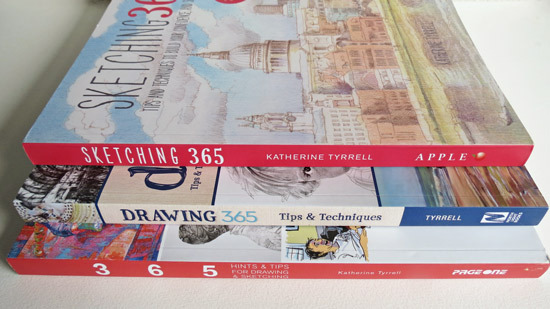 Now I've got my head above the parapet, I'd just observe there are lots of different ways of making art - as artists from other art societies have already shown us. I'd just really like to see coloured pencil artists exploring their medium more. Posted by Making A Mark on Friday, October 12, 2012 9 comments Who's linking to this post?